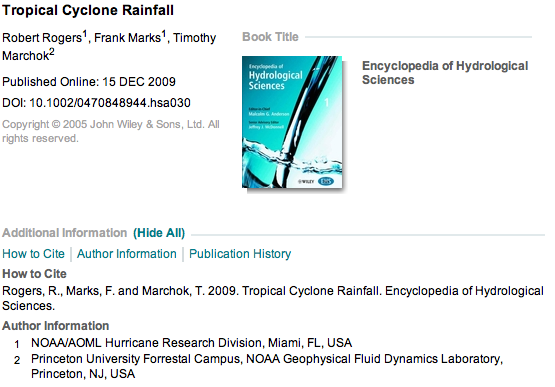 Abstract: A brief survey of the relevant research of tropical cyclone (TC) rainfall is presented here. The importance of TC rainfall in global and regional rainfall budgets is discussed, as is its mean characteristics as derived from airborne and satellite observational studies. Discussion is also presented on the physical processes that can modulate TC rainfall distributions, including topography, storm motion, vertical shear, and extratropical transition. Some tools that have been developed to predict and evaluate forecasts of TC rainfall are discussed. Finally, a summary and outlook for the future is presented, including a discussion of opportunities for improving TC rainfall forecasts and conducting research into the role of TC rainfall in intensity and structure changes in TCs. You can find this paper online at http://onlinelibrary.wiley.com/doi/10.1002/0470848944.hsa030/abstract.